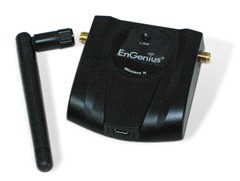 EUB-9701 EXT2 implements the latest 802.11n technology which extremely improves wireless signal for your computer than existing wireless 802.11g technology. EUB-9701 EXT2 supports hardware-based IEEE 802.11i encryption/decryption engine, including 64-bit/128-bit WEP, TKIP and AES. Also, it supports WPA and WPA2 encryption, and works with Cisco CCX V1.0, V2.0 and V3.0 compliant.